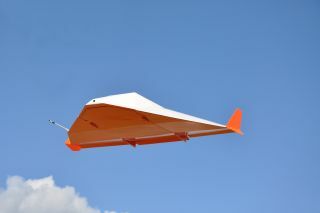 Near Space Corp.'s High Altitude Shuttle System (HASS), a drone that carries new technologies to high altitudes for testing, was used to simulate the return of a spacecraft through controlled airspace. A drone that drops into flight from a high-altitude balloon is helping the Federal Aviation Administration (FAA) to test new technologies for surveillance of commercial spacecraft in national airspace. Near Space Corporation (NSC), a private spaceflight company that operates at the Tillamook Naval Air Station in Oregon, sent its High Altitude Shuttle System (HASS) into flight using a stratospheric balloon on Oct. 3. The unmanned drone, which regularly carries new technologies for in-flight testing, brought along a payload of equipment designed to help the FAA detect and track commercial spacecraft. The stratospheric balloon lifted HASS to an altitude of 70,000 feet (21,336 meters) before releasing it for a semiautonomous glide flight that simulated how a winged spacecraft would enter Class A-controlled airspace, which includes altitudes over 18,000 feet (5,486 m) and up to 60,000 feet (18,288 m). Near Space Corp. launched this high-altitude balloon carrying a drone with a special payload of new FAA technologies from an FAA test site in Tillamook, Oregon. It took about 30 minutes for the drone to return to its launch site. During that time, the FAA tracked the drone to test its new surveillance technology. Although the results of this flight test are still being analyzed, plans for similar experiment are underway. This flight test made NSC the first commercial suborbital space company to fly under the FAA's new Unmanned Aircraft System (UAS) rules that went into effect in August. Regulations now require drone pilots to have a special Certificate of Authorization (COA) for flying at high altitudes. "It was great to get this first flight with the new COA under our belt," Near Space CEO Tim Lachenmeier said in a statement. "It took a long time, and a lot of dedicated support from the FAA to get this accomplished. NSC is very excited about the opportunities this high-altitude UAS COA provides, and the unprecedented ability to support testing of technologies for the commercial space industry." NASA funded the balloon-aided drone flight through its Flight Opportunities Program, which supports the use of commercial suborbital vehicles to test new technologies. "Flight testing and advancing technologies needed by the FAA to allow detection and surveillance of future spacecraft while entering the national airspace is crucial for the Flight Opportunities program," Paul De Leon, NASA'S Flight Opportunities campaign manager, said in the statement. "The program is continuing to grow by adding new commercial suborbital launch vehicles as they become viable, which can increase opportunities for maturing technologies much needed for future space exploration."